[:en]Water security has become a very hot topic in discussions on climate change adaptation. Access to water is one of the most basic human needs, essential to cooking, hygiene, sanitation and, needless to say to keep our bodies alive and functioning. Unfortunately, as a result of climate change, this vital resource is becoming increasingly scarce. But water is not only a matter of life or death, it’s also about gender inequality, economics and missed opportunities for girls and women. Water is closely tied to gender roles in many societies. In most parts of the globe, women are the ones traditionally responsible for securing the water needs of the household. In Sub Saharan Africa, for instance, in eight households out of ten, this task falls to women and girls. Mongolia is actually the only country in the world where fetching water is the primary responsibility of men and boys! The World Health Organisation (WHO) and UNICEF estimated that women collectively spend 200 million hours every day collecting water for their families. 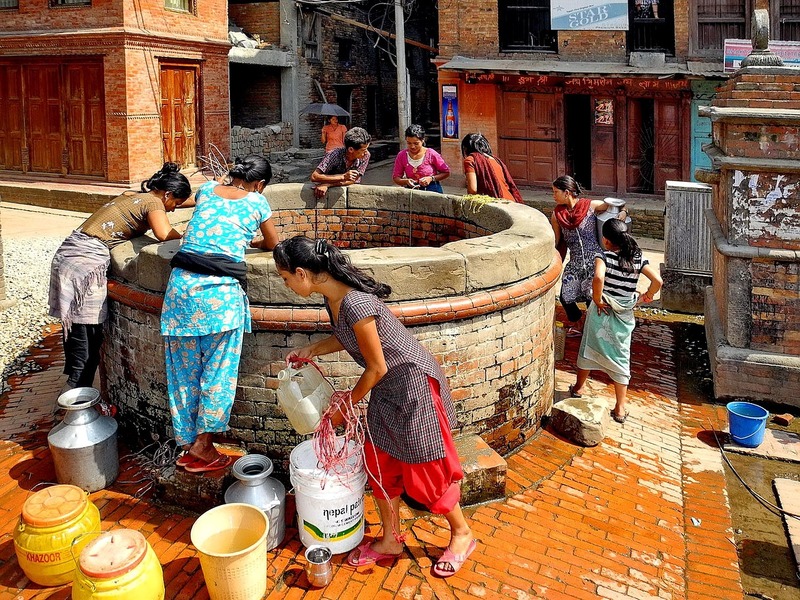 “Just imagine: 200 million hours is 8.3 million days, or over 22,800 years,” said UNICEF’s global head of water, sanitation and hygiene Sanjay Wijesekera at last year’s World Water Week. “It would be as if a woman started with her empty bucket in the Stone Age and didn’t arrive home with water until 2016. Think how much the world has advanced in that time. Think how much women could have achieved in that time.” Indeed, this seems a colossal waste of time, time not spent on self-development, education, income generation, political mobilization and leisure. In Morocco, on the fringes of the Sahara desert, women have taken matters into their own hands. Dar Si Hmad, an NGO led by women created and constructed what is now the world’s largest fog harvesting system in the world. The system, which is situated in the Ait Baamrane region, has been designed to relieve the increasingly severe droughts, which make it very difficult for communities who relied for centuries on rain and well-water to secure their water needs. In the last decades, droughts have led to an ever more dire situation in the region, prompting massive migration of males seeking work in urban areas, leaving women and children behind. Based on ancient water practices, the fog harvesting system uses a specific type of mesh that is suspended between two posts. It relies on plentiful fog that is carried from the Atlantic Ocean into the mountains for parts of the year. Water drops get caught in the mesh and flow down into pipes. The water is then cleaned using UV light and sand filters. Drop-by-drop, the system collects 6300 litres of water on average each day, enough to provide a continuous water supply to 400 people in five villages, mainly women and children. Prior to the installation of the new system, women would often spend three or more hours each day lugging water, now fog delivers water directly to the villages. Dar Si Hmad has invested more than 10 years of research to study the feasibility of the technology, which is now spreading to other parts of Southwestern Morocco. The NGO plans on creating a Fog-Water Network to disseminate its knowledge. In the Western Indian state of Gujarat in India, Naireeta Services, a social business working towards poverty eradication in India, has developed another unique water harvesting system called Bhungroo, which stores water from excess rainfall to use in the dry season. In the semi-arid region, farmers are faced with the double challenge of either too little or too much water depending on the season. Most of the year, the state experiences dryness with some periods of severe droughts, which are then followed by months of monsoon, heavy rainfalls, severe floods and waterlogged fields. The standing water increases the salinity of the soils which in turn creates an impermeable layer that leads to more waterlogging and even higher salinity. This makes farming very challenging, especially for those farmers that cannot rely on irrigation, which is the case of most underprivileged women farmers in the region. Creating a solution out of a challenge, the Bhungroo system captures excess water during monsoon and stores it for the next dry spell, artificially increasing water contained in existing underground reservoirs and thereby allowing for year-long food security. An added benefit of the system is that the stored rainwater decreases the salinity of underground aquifers, making the water more suitable for irrigation. Bhungroo is now an entirely women-driven activity. Naireeta Services trains women to build, maintain and monitor the structure. Groups of five women jointly own each erected system. Naireeta Services provides the technology open-source, however, with the understanding that it can only be used by poor people. With the help of Change Agent, a Boston-based organization, Bhungroo is currently spreading to parts of Africa. In Benin, the challenges faced by women farmer are all too similar to the ones in Morocco and India. In the northeastern district of Kalalé, a six-month dry season makes it nearly impossible to grow any food and women and girls often have to haul water over very long distances during the rainless months. To overcome these challenges, the NGO Solar Electric Light Fund (SELF) which dedicates itself to fighting energy poverty through solar solutions, has designed an innovative system that combines solar-powered pumps with drip irrigation. The pumps retrieve water from nearby rivers and underground aquifers, which is then used to irrigate 11 half hectare-sized gardens in 10 villages. Each garden provides space for 30-40 women to work in and the cultivated fresh fruit and vegetables directly benefit over 3000 family members. Part of the produce is also sold on the market, generating income for the women vendors, with the added benefit that women and girls can dedicate their time to other pursuits than transporting water. The initiative has emboldened women in the region. They have recently taken the culturally radical decision to elect an all-female board for ADESCA, the local organization managing the activities in the gardens and the partnership with SELF. In comparison with a solution using diesel pumps, the SELF system does not generate greenhouse gas emissions. Drip irrigation also provides major water savings, while reducing fertilizer and pesticide use, making it not only a great social initiative, but also an environmentally one. All the projects and solutions featured in this post have received numerous prizes, among them the prestigious UN Momentum for Change award.